Today, we’re going to talk about California: a majestic, beautiful West Coast state discovered in the 1800s by adventure-hungry settlers who left behind their families and jobs back east in order to set off across the country and sit in traffic on the 405. I am just kidding, of course: nobody made it to California in the 1800s, because they all died of dysentery on the way. But the state is now home to a whopping 39 million human beings, of which approximately 38 million are car enthusiasts. You can’t not be a car enthusiast when you live in California, because you end up spending so much time in cars. You’re conceived in a car. Your mom is driven to the hospital in a car to give birth to you. Then you’re born, and you spend 80 years of your life commuting around the state in a car. And then, in the end, when you die, they load you up into a hearse, which promptly gets stuck in traffic on the 405. But this column is not about traffic. 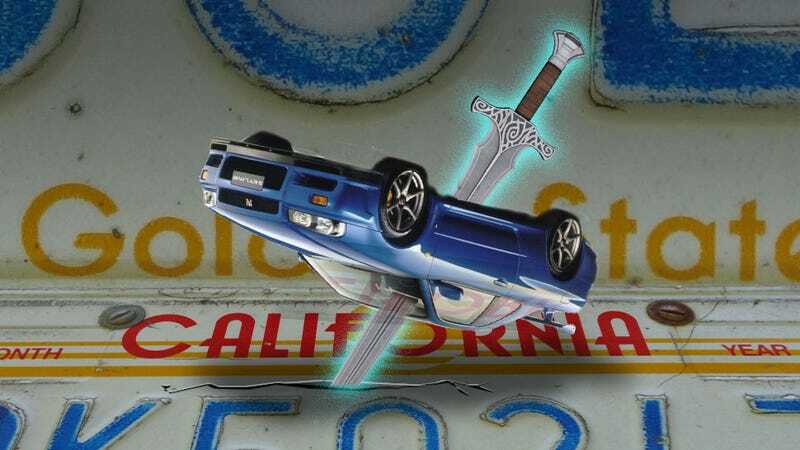 It’s also not about the fact that California still does not have an official state-issued temporary license plate, which means California residents are still free to drive around the state with a cardboard insert reading “TOYOTA OF SAN WHATEVER” as their only visible proof of registration. No, this column isn’t about any of that. It’s about emissions, collector cars, and the fact that California is a broken place for many car enthusiasts to live. In order to set the scene, we must start with Bring a Trailer. For those of you who don’t know what Bring a Trailer is, it’s an excellent automotive website that shows off some of the most unusual and bizarre vehicles for sale across the world at any given time. They’ll post a half-track, and then they’ll post a vintage T-Bird. They’ll post a 1950s FIAT, and then they’ll post an E30 Touring. Because of this, it’s the very first thing I examine when I wake up each morning, right after I check my pulse to make sure I’m still alive. So, back to California. Here’s what happens: Bring a Trailer will post some cool old car, like a Ferrari 365 GTC/4, or a Euro-spec BMW M5, or a fully federalized early 2000s Audi RS4 Avant. And the first few commenters will ooooh and aaaah and talk about how much they wish they had enough “garage space” for it. And then, invariably, some guy will get on there and reply: I’d never pay that kind of money for that car. You could never register it in California. Well, I have news for you, Californians: it isn’t the car’s fault you can’t get it registered. It’s your state’s fault, because your state has some broken, backwards rules that heavily punish car enthusiasts. And if you don’t like it, then for God’s sake you should change it. Allow me to explain. Most states have rolling cutoffs for emissions tests. For example: here in Pennsylvania, vehicles older than 25 years are exempt from emissions. This means that in 2015, any vehicle older than 1990 is exempt. In 2020, any vehicle older than 1995 will be exempt. In 2000, any vehicle older than 1975 would’ve been exempt. Well, California did away with the rolling cutoffs, and now everything manufactured after 1976 must pass the state’s strict emissions tests. Yes, you heard that right: that 1977 Lamborghini Countach with the beautiful Gandini design and the gorgeous unspoiled wedge shape – the car you drive 350 miles per year, only on sunny Sunday mornings while the dew is still on all the leaves, and your neighbors are still asleep, and people on the 405 are just climbing out of their tents to continue their Friday evening commute home – is still subject to an emissions test, just like a suburban mom in her 2007 Honda Pilot with rear DVD screens and Dorito crumbs in the CD slot. Emissions isn’t the only issue. Every few days I get an e-mail from readers in California who wants to register a Nissan Skyline like mine, and they always ask roughly the same thing: Is it possible to register a Skyline in California? Could I do it? Can it be done? And my response is always something along the lines of this: yes, you could do it. But you also could eat a bowling pin. The question is: do you want to do it? Because here’s the situation with imported cars in California: since your vehicle is new to the state’s vehicle database, they subject you to the very same regulations as an actual automaker coming out with an all-new product. In other words: it’s not just “hook it to an emissions test and make sure it passes.” Instead, it’s: take it to a laboratory where actual scientists in actual lab coats examine every inch of your car’s exhaust system for any sort of pollutants larger than a taste bud. And the second they find one, you fail. Oh, yeah, and this test costs $1,500 each time. And you’ll probably fail more than once. Just to be clear, this is a fact: no state in this entire country is as strict on older and imported cars as California is. But don’t worry, Californians, because here’s another fact that may help you rest easier: there are 49 other states in this country. And the vast majority will allow you to register older and imported cars with only minimal loopholes. Meanwhile, back in California, the local emissions test place must go through the entire testing process on both a 2009 Chrysler Town & Country used every day or 1991 Ferrari F40 with 2,000 miles. All so the two cars can sit next to one another in traffic on the 405. This column was edited to reflect the fact that the emissions testing procedure between and older vehicle and a newer one is not identical.